David Copperfield is humiliated by the schoolmaster in 2000 film. 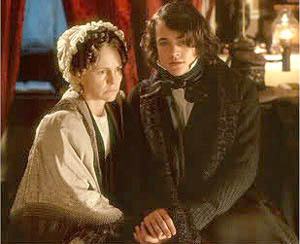 If you cry during the 2000 American TV version of David Copperfield, it may be for reasons unintended by Dickens. Filmed in Ireland and a similar length to the great British mini-series of the previous year, this one is not nearly as successful in reimagining Dickens's world. It focuses more on the second half of the novel, on the grownup David recalling his abuse as a boy at the hands of Murdstone. British actor Hugh Dancy is quite good as an appropriately romantic adult David. One wishes he were in the 1999 series as the grownup Copperfield. Sally Field and Hugh Dancy. But the two American stars, Sally Field and Michael Richards (of Seinfeld fame), really chew up the scenery. Field doesn't quite nail the Aunt Betsey role, coming across as a silly country hick, calling "DonkEEEES" like Minnie Pearl with a bad English accent. Richards, of Seinfeld fame, is a stumbling, buffoonish Mr. Micawber, far from the dogged, dignified failure of the novel. The script also takes great liberties with the source material's narrative, replacing many of Dickens's subplots with new ones of the screenwriter's fancy, such as making stepfather Murdstone an ongoing villain of the piece instead of being vanquished in the early going—turning this film into what might be called David Copperfield's Revenge. Nonetheless, this is an honest attempt to bring new life to the story with sincere direction and high production values. A number of scenes actually do work well, making the film entertaining in its own fashion. Passable for Dickens fans, if you cannot lay your hands on the real thing.